Ms. Hoover: What was Christopher Columbus actually looking for when he discovered America? Ralph: [hand up] Ooh! Ah! Ms. Hoover: Ralph, this better not be about your cat. We are making some sloooow progress on the bedroom/closet project, but with work so crazy, it’s a bit like wading through treacle. While this makeover is pending (and to help me stay motivated), I want to share one we did earlier. 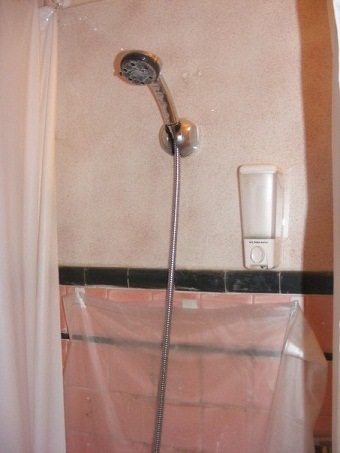 Our house is from the 192os, but the bathroom had been redone in the late 1950s or so. If you just walked by the bathroom, it looked pretty good. When we bought the house, the upper walls were covered in bright blue fish wallpaper. For some reason, I never photographed that. In the years between that remodel and our purchase, several layers of questionable flooring were added (poorly), as well as a nasty cheap vanity. It’s a small bathroom and had no storage to speak of. What floorspace there was was dominated by an oversized radiator (now installed in our bedroom). This vinyl was about the fifth layer. 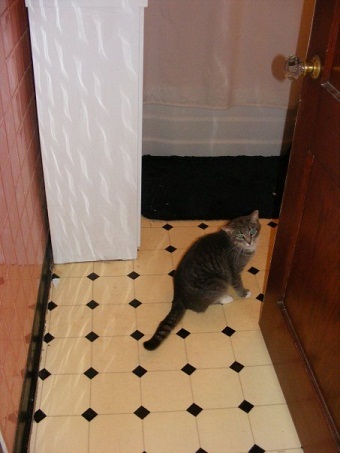 It was held down with visible staples (and a cat) rather than with whatever you properly use for vinyl flooring, which I know is not staples. The vanity cabinet was that faux-wood particle board, which I had painted white. Look at that door sag! As you can see, the old bathroom featured pink and black tile. 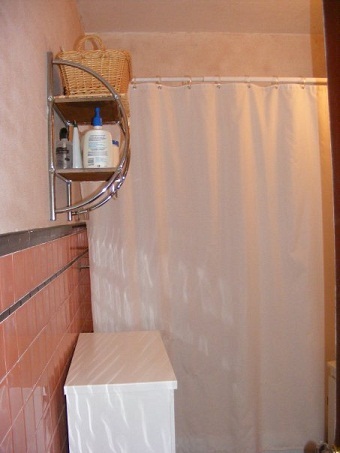 I want to assure all lovers of pink bathrooms that we were on board with having a pink bathroom. I like ’em. If there had been infrastructure there worth saving, we would have conserved it. But the plastic tile had been installed without spacing for grout, and as far as we could tell, with some sort of industrial adhesive not intended for tile. They could not be taken off the wall intact, and since they could not hold grout, the plaster behind the tiles had swollen with water and contained a fair bit of mold. This shot most accurately shows the condition of the tile, and some of our contrived attempts to work with it. While I like an intact pink bathroom actually dating from the pink bathroom era, I wasn’t going to replicate the look on principle. We went for classic black and white tile and added colour on the walls. We chose hex tile for the more-open floor and glass block for the window (formerly double-hung but covered with a shower curtain). 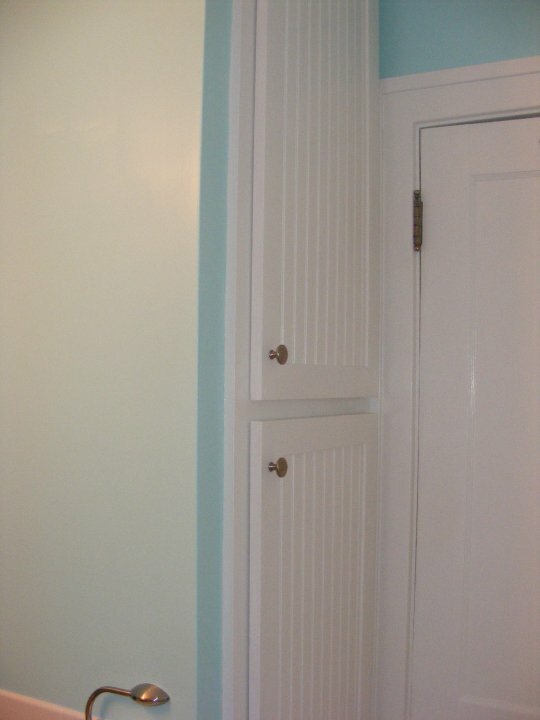 A smaller radiator was recessed into the wall on the left. 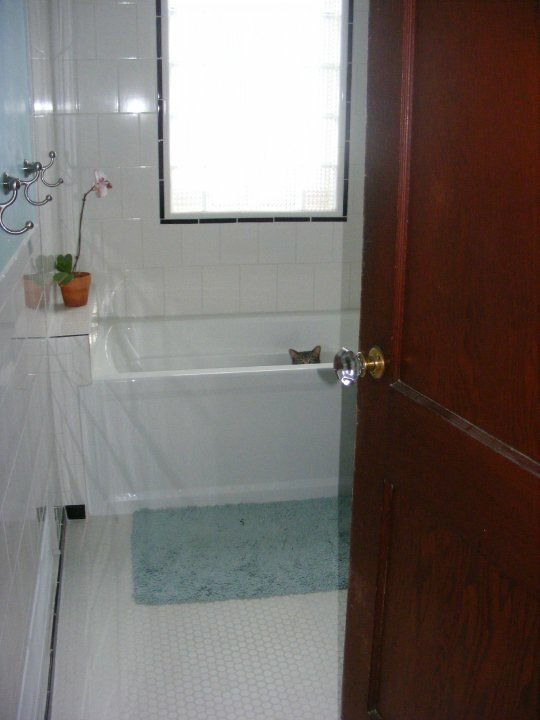 A cat was installed in the bathtub. We decided on a vanity cabinet again for storage reasons instead of a pedestal sink. I was of two minds about using a vessel sink, but the best 18-inch vanity cabinet I found was made for a vessel sink and it’s an easy thing to swap out later if we ever tire of the look. Plus, having a vessel sink actually gives us a little bit of counter space we otherwise wouldn’t have. Vessel sink and vanity cabinet — only 18 inches wide. It’s a TINY bathroom. The wall colour is “Hawaiian Sky” from Dutch Boy (E4-4) in semi-gloss. The hunt for the right aqua or Tiffany blue led to Saucy Dwellings and a whole place done in that shade. What? It’s for me, right? Cabinet doors added to access otherwise dead storage space (and the laundry chute). 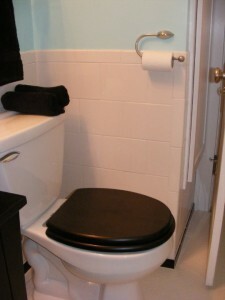 Toto toilet — there’s a whole post coming at some point on how hard it is to find a compact toilet. This one was perfect. The medicine cabinet is mirrored inside. I initially thought that was silly, but it’s nice in practice. It’s still kind of silly. We did some things that were really specific to us. We picked hooks instead of a towel rod. We just liked them better for this particular room. The Kev chose the Hollywood vanity light because they are not used in England, so it struck him as quintessentially American. I picked a black toilet seat because when I was a kid, it always seemed like fancy old buildings had black toilet seats, so it makes me feel fancy. If you can’t feel fancy in your own bathroom, where can you feel fancy?? There’s even mood lighting integrated into the extractor fan in the bathtub area! 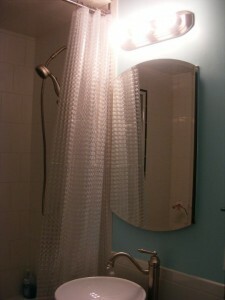 This is one of the most satisfying remodels we’ve ever undertaken. I appreciate that room every time I walk in there. It just has a bright, refreshing feeling. And when we’re in Project Mode, it’s nice to remember that things do eventually get done. 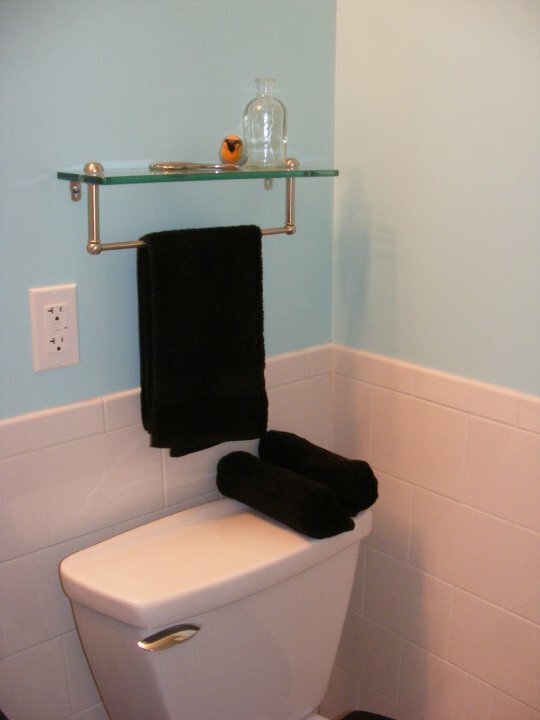 This entry was posted in Bathroom, Before & After, Decor and tagged bathroom remodel, bathroom renovation, bathroom reveal, small bathroom remodel, Tiffany blue bathroom. Bookmark the permalink. 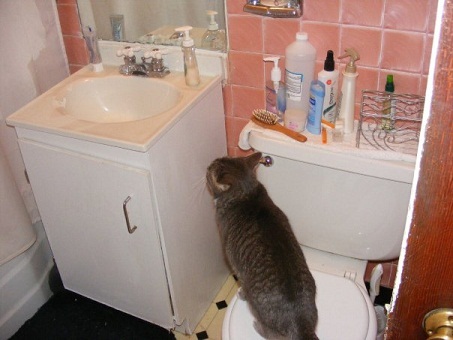 Where did you buy the 18 inch vanity with sink? 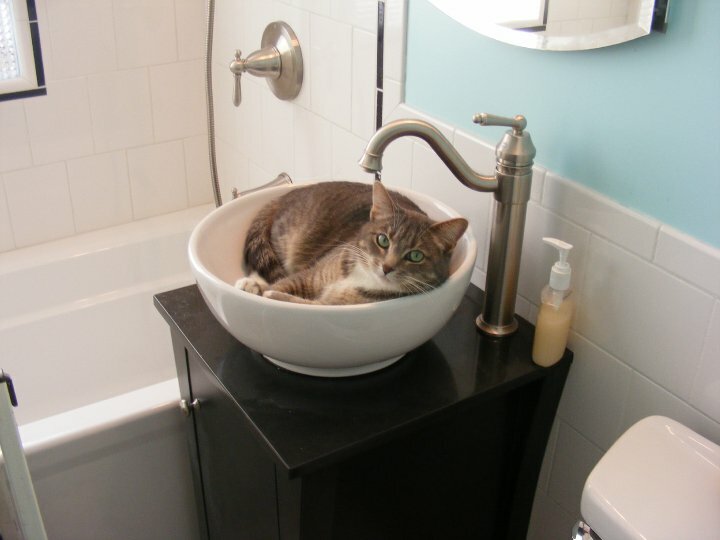 Hi, Sam — we got the vanity at Home Depot and bought the vessel sink separately. It’s a Decolav model, but it has been discontinued. They do have the same one online, only the cabinet is white: http://tinyurl.com/o58nezq. You might want to check eBay or CL for a cheaper price, though — we paid MUCH less than what they are asking now for the cabinet. 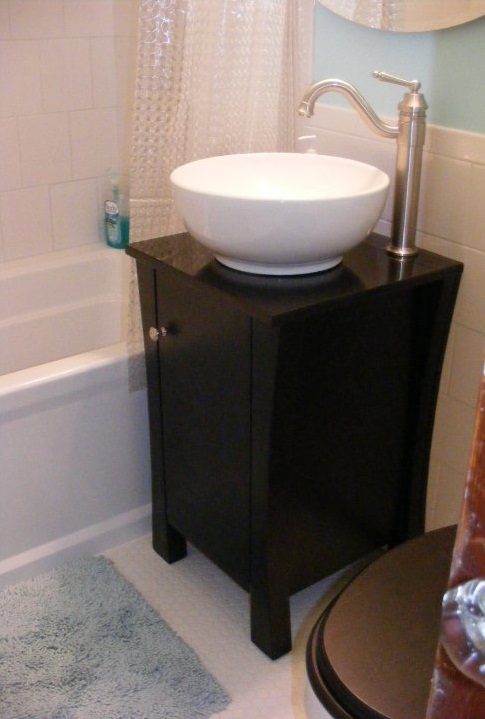 It’s a really good unit, and I know it’s really hard to find a non-crappy 18″ vanity. Good luck!